These days, only poets read poetry. (Students do not count.) As Dana Gioia wrote, this was once a damning criticism and is now simply a marketing strategy. Poetry’s relevance to the general public seems to decrease every year. Despite paeans to the art such as Natasha Trethewey’s gorgeous essay, “Necessary Utterance“, poetry remains firmly within the baliwick of ivory tower Beefeaters. That Ms. Trethewey’s beautiful article was published not in The Atlantic, or Time, or The New Yorker or any other general interest magazine but instead in the highly specialized VQR merely illustrates the point. It wasn’t always this way. Poetry used to matter. Not just to MFA poetry students and “creative writing” teachers–because there were no such things then–but to the common reader. Poetry had far more outlets for the general public in the 1920s than it does now. While the sales for the average poetry book by an individual author remained remarkably consistent over the whole 20th Century–roughly 1,600 copies, by one Toronto professor’s reckoning–what sharply declined were the sales (and the prestige) of poetry anthologies. 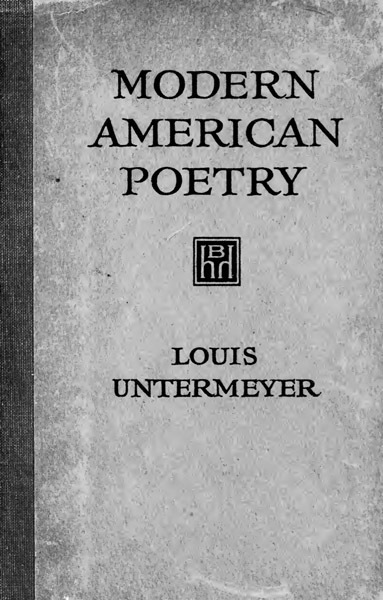 One of the most famous anthologies in American history is our e-book of the week: Louis Untermeyer’s Modern American Poetry; An Introduction. Its history is illustrative. Not only was it massively influential to poets themselves, but also greatly respected by the public. Between 1919 and 1950, it went through seven different editions, and sold over a million copies–assuredly not all to poets. Such sales would be inconceivable today, not because book sales are down, but because one would be hard-pressed to find a million people–or even 143,000, if one is cynical enough to presume that the same people bought all seven editions–who actually care about poetry enough to read a whole book of it, at any pace, to any degree. Others had more political reasons. “Modernism” became a buzzword, a battleground for identity to be fought by those who sought to define literature and through literature the universe. For them Untermeyer was too populist, too slipshod. They preferred Brooks & Warren’s anthology or whoever else they thought represented a more high-minded approach. All of which has very little to do with the actual material included in Untermeyer’s book. In this release from the Star, we have cleaned up the source from its original 1919 first edition pages. What will probably strike a reader first is the sheer number of unfamiliar names. Some names will be very familiar, even to the laity: Emily Dickinson, Robert Frost, Ezra Pound, Carl Sandburg. Regular poetry readers may also recognize Sara Teasdale, H.D., Paul Laurence Dunbar, Edgar Lee Masters, Edwin Arlington Robinson. The rest are obscured by history. It’s also interesting simply to track the names of writers themselves. There are Dickinson, Field, Riley, Woodberry etc. in the early pages. As the book moves chronologically forward, one can espy Cawein, Le Gallienne, Guiterman, Oppenheim, Brody…reflecting the changing, immigrant character of America itself. Download our Modern American Poetry; An Introduction EPUB here. Download PDF version from the Internet Archive here.